I found a recipe on pinterest that piqued my interest – halibut scallops! We had to try it out. So we did, and it turned out pretty awesome! I did make a few modifications, as the recipe as-is just didn’t sing quite right to me. You will need 1 zucchini, using a peeler to make long, thin strips. 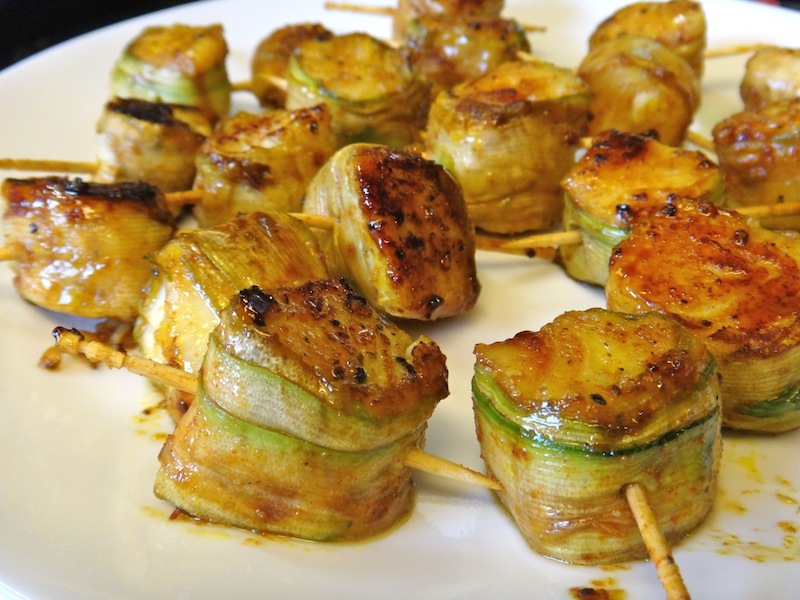 In a small bowl, mix together 2t smoked paprika + 2t cumin and sprinkle this on both sides of each of the zucchini strips. And coat all sides of the scallops in this mixture. 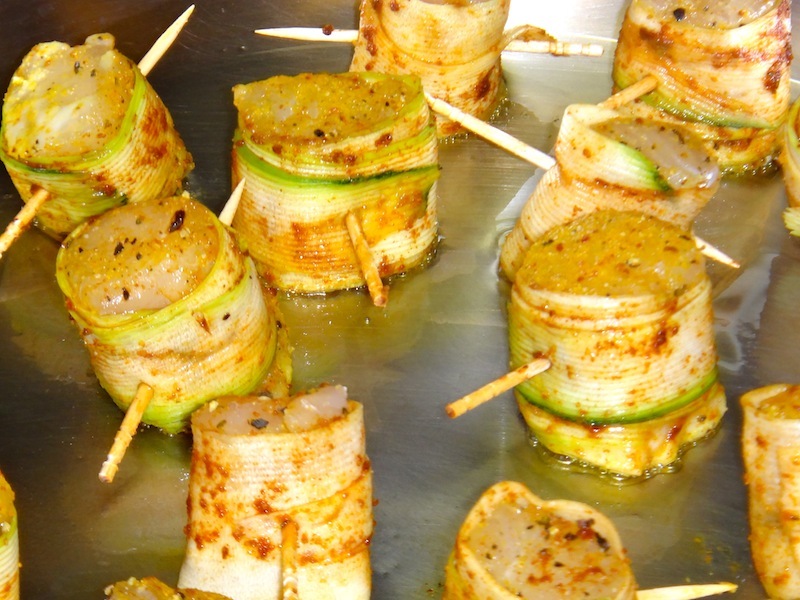 Next, wrap the zucchini strips around the halibut and close with a toothpick. In a large skillet, heat a touch of olive oil and place the scallops in an even layer, not crowding the pan. Cook about 2 minutes per side. Before turning over, drizzle or dab some glaze on the one side, flip and dab glaze on that side. It’ll sizzle and stuff, but that’s perfect because you want that caramelization. 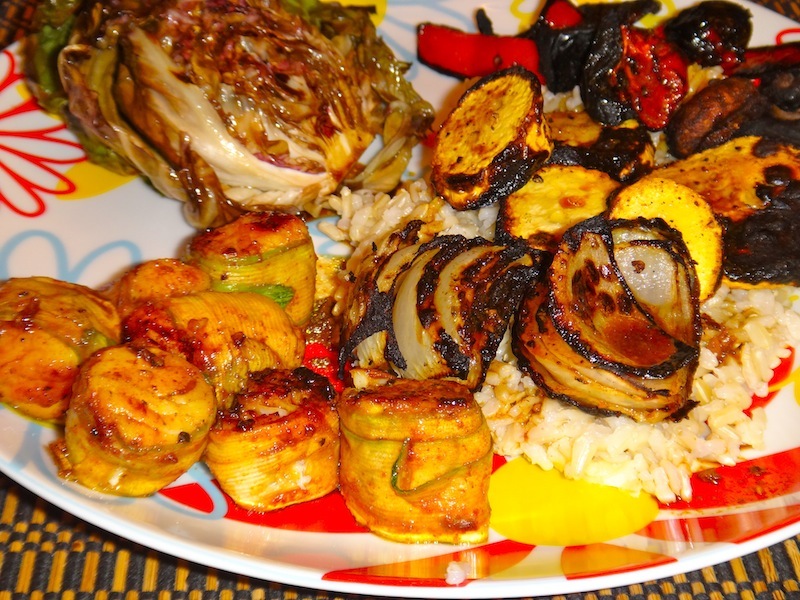 For this meal, we grilled up some vegetables (possibly charred a bit much, but whatever) as well as some radicchio served with a balsamic Dijon dressing. All the flavors here melded extremely well! The effort for the scallops is worth it – these bite size pieces are quite delicious! Whoa..that looks like a winner. And just so happens we’ve got some Halibut cheeks in the freezer from our last order from Seattle. Going to make that this weekend with a nice bottle of white wine!